Google+ is one social media outlet that needs a little explaining. I’m not sure why Google thinks these things need to be complicated. Regardless of how complicated Google+ may seem, there are some really cool features if you have patience to learn how to use them. 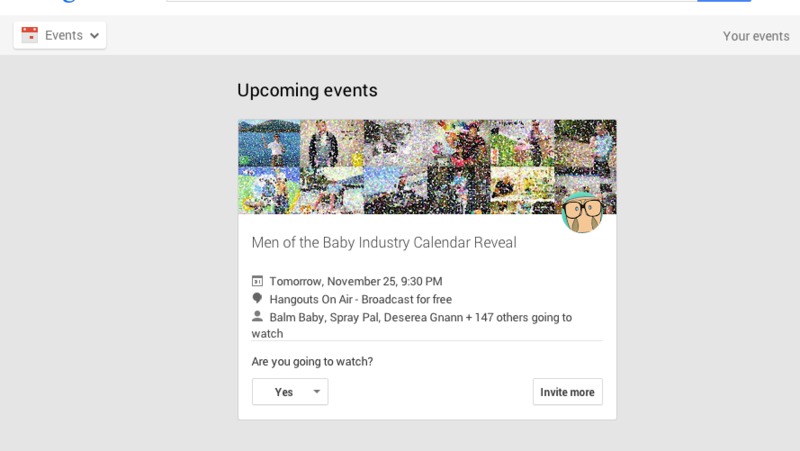 Google+ Chats (or Hangouts On Air) are a fun way for you to interact with bloggers, brands, and friends live on air. The first thing you’ll need to do is set up a Google account if you don’t already have one. Most of us have one connected to Gmail, YouTube, or other Google owned application. Once you have a Google account you can set up your Google+ profile. It’s very similar to setting up a Twitter or Facebook profile and you can decide what information to share. If you’re using your mobile device or tablet you may need to download the Google+ app first. Next you’ll need to RSVP or confirm that you’ll be attending (or watching) a specific chat or hangout. 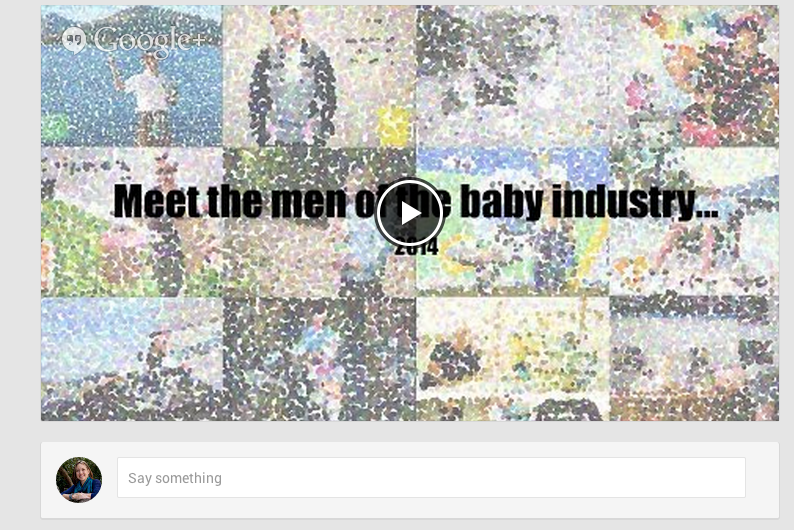 For the reference of this post we’ll be using the #MenofTheBabyIndustry G+ chat on Tuesday, Nov 25th (9:30pm ET). By telling the host that you’ll be watching, you’ll also be sent a reminder when it starts so you don’t forget to go watch. The hosts would love it if you followed them on Google+ too. 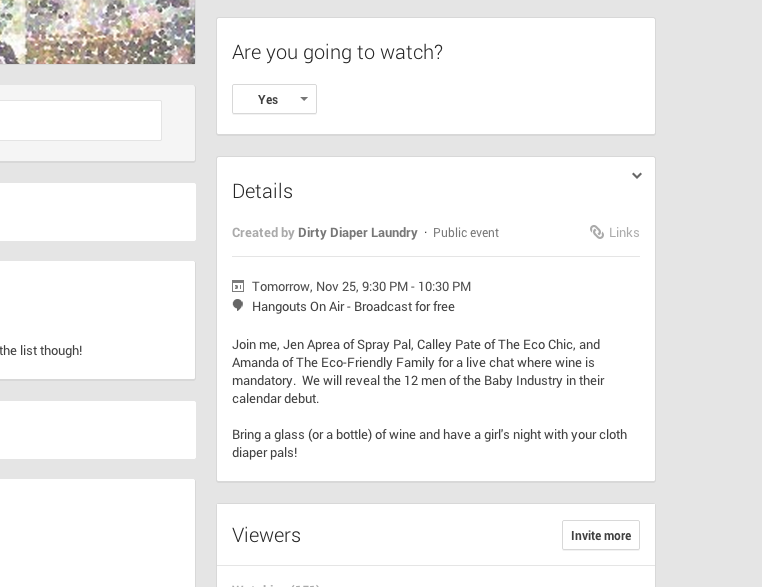 At the time of the chat, head over to Google+ and click on “Events.” You’ll see any “Events” that you’re RSVPd to on that page for quick reference. You can click on the title of the “Event” to get to the next page. From the main “Event” page, you’ll see a play button. If the event isn’t live yet, you’ll likely see a trailer video that will play. Once the event is live on-air, you’ll actually see the hosts chatting in the video. Do you have to be on video too? Will you need a web cam? No!! The only people in the video will be the hosts and Google+ limits that to about 10 people. Most chats will have just a few hosts or guests live on air. You’ll just need to click to watch them during the chat. That’s good news for you, you get to stay in your pajama’s with your hair in it’s messy ponytail! You can join in by chatting with the hosts in 2 different places. If you chat with them on the event wall, everyone can see and reply to you but the hosts may not see your post during the chat. The second place is only visible when the chat is live on-air. There is a place in the pop-up viewing screen where you can ask your questions or add your comments. That’s the easiest place to chat with the hosts because they can see that from their recording view. If for some reason you can’t figure out Google+, you can also watch the chats live on YouTube or recorded later after the chat. 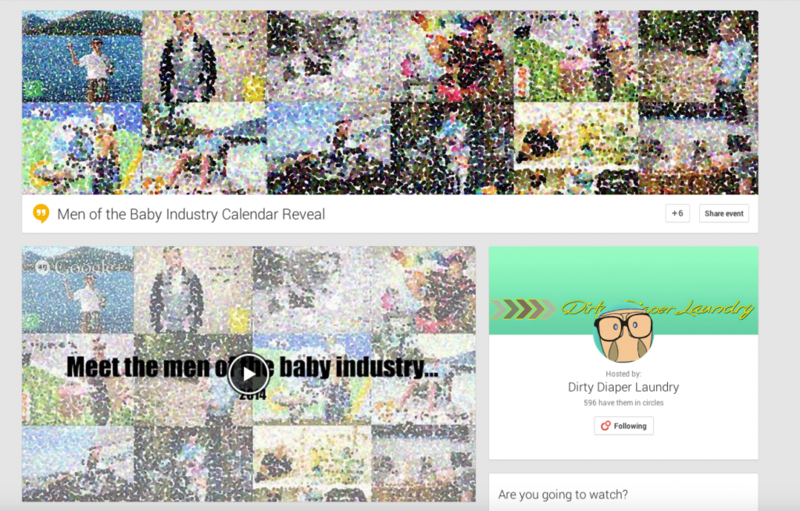 Give it a try Tuesday, November 25th at 9:30pm when Spray Pal, Dirty Diaper Laundry, Green Child Magazine and myself reveal the men inside our Men of the Baby Industry Calendar. We promise to make you laugh and we may even giveaway a few prizes including; an AppleCheeks Microterry Little Bundle, a Tots Bots Easy Fit in Royal Flush (RARE), a Spray Pal, a LÍLLÉbaby COMPLETE All Seasons in Stone and a matching doll carrier, a Beco Gemini Baby Carrier in Arrow Print, EcoNuts Baby Liquid Laundry Soap, BabyKicks One Basic and one Premium Diaper, a Sloomb VHLC fitted diaper, and a Balm Baby Mens Pack of goodies! You can find out more about how to enter to win these prizes here: Revealing the Secret Project! To follow me on Google + you can follow +Calley or +TheEcoChic.